NASA today reported that a space probe launched about 22 years ago for the close up studies of Jupiter and Saturn has entered the tail of the solar system where the constant stream of charged particles flowing in from the sun decline. Computer models show that this last phase of the solar system will last for another four years though scientists really don’t know what to expect. 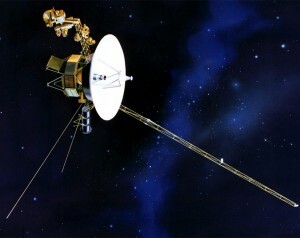 The two Voyager spacecraft are at a point where no other spacecraft ever ventured. Voyager 1 is now about 10.8 billion miles from the sun and is traveling in a region of space known as the heliosheath. This is a turbulent area between the sphere of space which is constantly influenced by the sun and its magnetic forces from interstellar space. Voyager 1, in June this year, relayed data that showed it was not traveling towards the outward flow of solar wind particles as expected. Instead the solar stream has turned a corner as it it sweeps into the tail of the heliosheath. Voyager 1 is flying at about 38,000 mph and is continuing its journey towards interstellar space. It is so far from Earth that its radio signals take 16 hours to reach the spacecraft. Voyager 2 which is a twin of the Voyager 1 is traveling at 35,000 mph and will leave solar system in a southern direction a few years after Voyager 1 which is the first human-made object in interstellar space. Scientists are positive on having five more years of studies beyond which the plutonium power fuel source of Voyager 1 will be depleted. Voyager scientist Rob Decker of the Johns Hopkins University Applied Physics Laboratory said, “Every time we go somewhere new we find something totally unexpected. We never expected to make it this far”. The Voyager team presented their findings at the American Geophysical Union conference in San Francisco this week. Water found in Solar System 175 Light Years Away! Spacecraft For Jupiter On its Way!